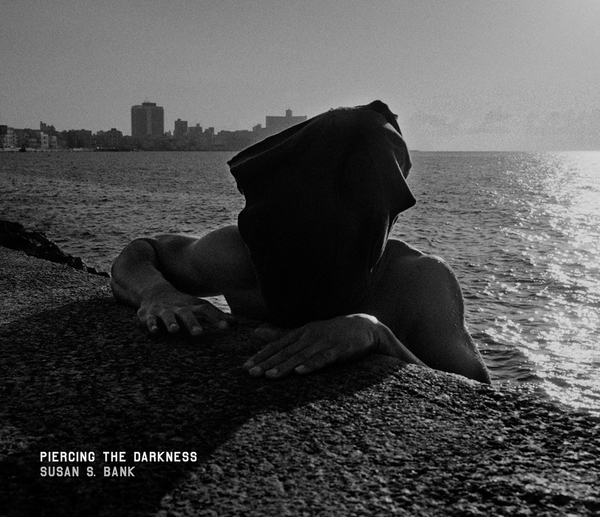 Book Review Piercing the Darkness By Susan S. Bank Reviewed by Karen Jenkins “For her follow-up monograph to Cuba: Camp Adentro (one of photo-eye’s Best Books of 2009), Susan S. Bank leaves the Cuban countryside behind and heads to the city." Piercing the Darkness. By Susan S. Bank. Brilliant Press, 2016. Photographs by Susan S. Bank. Text. John T. Hill and Susan S. Bank. Brilliant Press, Exton, PA, USA, 2016. In English. 128 pp., 77 quadtone plates, 10¼x12¼". For her follow-up monograph to Cuba: Camp Adentro (one of photo-eye’s Best Books of 2009), Susan S. Bank leaves the Cuban countryside behind and heads to the city. Piercing the Darkness is her take on life in Havana, in beautifully inky, heady images made between 1999 and 2009. If her first book stood out for its singular depiction of rural tobacco farmers in Pinar del Rio Province, this time around she’s entering the fray; slipping into the urban landscape, and the denser ranks of those others who have also photographed Cuba’s urban soul. Bank distinguishes herself most immediately with her use of black-and-white images where so many have declared color as Cuba’s first language. Bank takes a purely artistic stance and embraces the mystery and ambiguity she sees in everyday moments to great effect. Her short introduction is titled “Interlude;” an apt framework for viewing a series so informed by the notion of time. Her pause, her step out of time happens in Havana and each image contributes to a suspension of the fixity and precision of this measurement. Bank writes: “I came looking for Walker Evans’ photograph of the tall black dandy wearing a white linen and straw hat – caught in front of a magazine stand – gazing out at time.” Many of her photographs capture residents of the city – the young and old, the down-on-their-luck and the better off, seeming to do just that – gazing out at time. Lost in their thoughts and alone in the crowd, Bank foregrounds the mystery of her subjects’ unknowable interior lives, tapping into the at-times surreal time shift her subjects proffer while avoiding the pitfalls of a romanticized view. In many images, she plays with time by drifting through the anytime, the everyday – a young woman, bored, wistful, seated behind a long empty expanse of a diner counter and the dogs finding trouble in the streets. In other images, there are hints of the special occasion, absent the clarity and resolution of the appointed hour – the bride in her wedding gown, the young man carrying a decorated cake. There’s even a nod to Evans’ last-century dandy, here in the figure of a man gazing out from his position on a corner step. His pose is suggestive of strength and perhaps a forced nonchalance. His polished shoes and elegant pinstripe pants are a counterpoint to the sense that all his remaining attire is layered on top or inside the case at his feet. In his accompanying essay, John T. Hill pitches the timelessness of Bank’s work, drawing connections to classic photographic books and iconic practitioners in the history of the medium. He argues for an affinity with Walker Evans (Hill is a former Yale colleague and now executor of Evans’ estate), pointing to the two photographers’ shared commitment to editing and sequencing their own books. He also assumes an oddly old-fashioned critical tone in his analysis. Singing the praises of a number of individual images, he emphasizes both technical mastery and symbolic import, in a way seldom encountered in a contemporary monograph: “The picture’s discovery, visceral response, and the shutter’s action were all realized within a blink. It was done with a minimum of means, routine technology, short tonal scale, adding to the deceptive simplicity describing this indelible image.” Nevertheless, his praise is justified and his argument for Bank’s masterful depiction of the mystery in the mundane is on point.